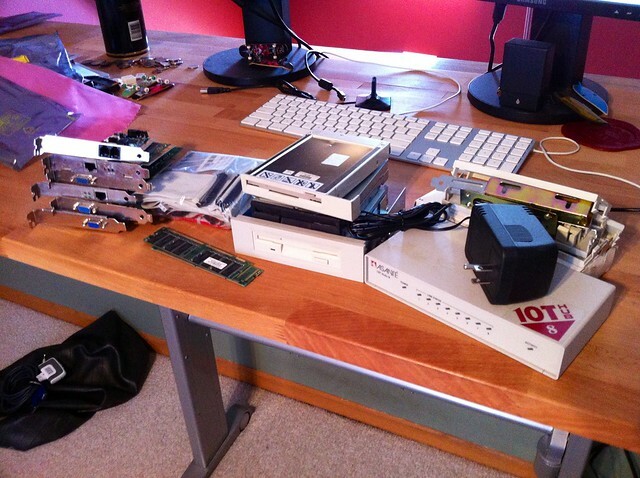 A bunch of old video cards, ethernet cards, modems, RAM, BUS cables, floppy drives, and an old 8-port hub I got from Cornell... all just went to Best Buy recycling. All your old tech gear pics are inspiring for me. In that, my wife (also named Kari) would love for me to do exactly what you are doing, and get rid of stuff...I have a lot of old tech. I'm trying clean out, but need to try harder. On a side note, if you know anybody in the DeMo area that wants an old SGI 1600SW monitor in great condition, I have all the parts, original box, plus the add-on Multilink Adapter. I'm taking serious offers (can't give this baby away). Most of the reason I kept this stuff around was not because I thought I'd use it again someday, but just cause I thought most of it was funny/nostalgic. This is exactly why I'm just taking photos of it and then getting rid of it in the best ways possible: donating, recycling, etc. And Best Buy recycling is completely free. They even take old cables, software, etc.